This modern, spacious apartment has been awarded a 4 star rating by the Scottish Tourist Board – "Visit Scotland"
A perfect base for your visit to Glasgow, with the 12,000 seater SSE Hydro and Scottish Exhibition and Conference Centre a short walk along the banks of the River Clyde. In addition, from our splendid location you are a 5 minute walk from St. Enoch square and Buchanan Street, the most exquisite street in Glasgow famed for its sophisticated shops & fine cuisine. Also within a 5 minute walk is the historic vibrant Merchant City with its trendy bars, cafes & restaurants A great place to spend a night out! 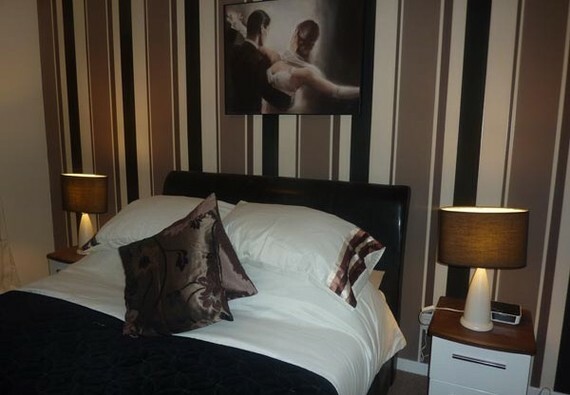 This apartment is in a truly perfect location for your stay in Glasgow. Relax, unwind and enjoy your stay. This is a non-smoking apartment and parties are prohibited. Exterior A city centre location with panoramic views from our balcony and over-looking the famous River Clyde, just 100 yards away. This two bed apartment has security entry and private parking is accessed by elevator. Parking notes The apartment has provision for one car parking space.This is in a secured entry parking area at the rear of the property. The car park can be accessed via a rear entry door to the building. Information on access to the car park will be provided by the Guest Host. Please note that commercial vehicles are not permitted in the car park. Interior layout The master bedroom has an en-suite with shower compartment. The bedrooms are carpeted for your comfort. The main bathroom has a shower over bath. The lounge, with a beech hardwood floor, is superbly decorated & furnished with patio doors leading onto the balcony where you can sit and enjoy the views over the river as you sip a coffee or a wine. Hard to believe you are in the city! Also in the lounge there is a raised balcony which can be used as a workspace or simply to relax with your reading material. The kitchen is fully equipped with every conceivable appliance. All crockery & utensils are also supplied. Towels and toiletries are provided in the bathroom. A welcome pack will be presented to you on arrival. No reviews yet for 110 - River Clyde Apartment 3.